Pomegranate Alhambra Punica granatum nana. 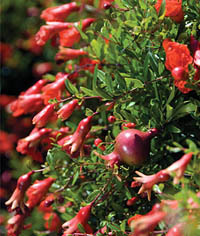 The dwarf pomegranate ‘Alhambra’ is really an ornamental shrub you will not be harvesting apple-sized fruit on this little charmer but with all the characteristics of standard pomegranates. Small, glossy leaves give the plant a full, fluffy profile and set off the flashy, deep orange-red flowers through the summer and miniature pomegranate fruits in fall. The shrub only grows to about 18 inches tall, but it invites close inspection and has surprising presence in a pot. Flowers and fruits last for weeks on the plant and are very long lasting in flower arrangements, where they are an unexpected and very showy touch. Pomegranates are ancient fruits, native to India and Asia and prominent in Egyptian art and culture. In Spanish, they’re called granada; a famous 16th-century stone archway at one entrance to the Alhambra, in the city of Granada, is decorated with three enormous pomegranate fruits. The archway is also embellished with the allegorical figures of peace and plenty, great symbols for a pretty and productive garden. The clue to this plant is in the name, Lily of the Nile, so you know they love to be planted in the sun. Strappy leaves and soaring stems topped by rounded flowerheads made up of white trumpet-shaped blooms with a violet-blue base. These plants need to be planted into a container on their own for the best effect. 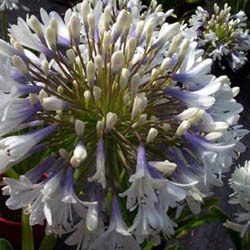 Don't fall for the old tale that agapanthus like to be potbound if they are to flower. They like to be snug, but not strangled. This plant is impressive when in flower and is a great feature on the patio or deck. The flower stems make a dramatic addition to a flower arrangement, the dry brown seed heads add height and structure to the garden containers as summer fades. The plant itself makes an easy house plant all winter long. Clean the plant of all yellow leaves and old flower heads outside before the first frost and move indoors into a sunny window. Water weekly and start fertilizing again about mid April with 20-20-20 in preparation to move outside after the risk of frost is over. If you want a really good and graceful grass with long and narrow, arching rich red brown foliage and then which transitions to a coppery brown with age. Come autumn, the red tones return, often accented with oranges and yellows. The Carex family of grass is a native to New Zealand and most North Americans are most familiar with little Hobbits running around on the brown hills in the South Island of N.Z. Yup this is the grass! We just love this plant and the only truly wonderful place to grow Cappuccino Sedge Grass is in the container. 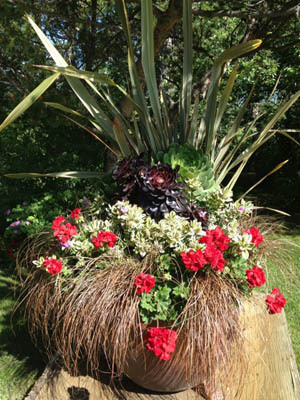 The foliage drips over the edge of the container up to 2 feet long creating a dramatic effect. This brown coloured sedge is an extraordinary complement to any planting; we love to mix it with Coprosma, which is another N.Z. plant. “So it’s just a Daisy,” you may say. Chrysanthemums are amongst the oldest of the ornamental cultivated plants and grown in China as long ago as 500B.C. and if that does not impress you this plant is just plain terrific. The semi-double, 4" flowers are produced in great profusion; they literally cover the entire plant and with regular deadheading they will keep on coming for the entire summer. They change color, too, opening lemon-yellow and lightening to buttery, banana cream shades, eventually turning to white. 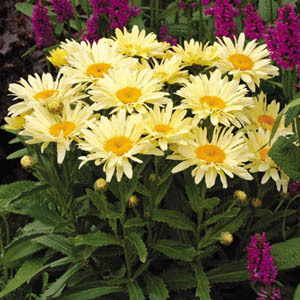 They have an endearing, shifting color pattern that brings a cheery and ever changing look to sunny garden areas. The growth is nice and vigorous, yet short and compact with shiny dark green foliage that makes the perfect backdrop to show off the bright, happy flowers. They perform well in containers and love to grow in a hot sun location, whether you are a devotee growing for the best display on the block or just love to have a daisy to snip for the cut flower arrangement on the kitchen table you will love this plant. How the fashions’ have changed. Less than 20 years ago this plant was relegated to the wild garden. Bells of Ireland, also known as Shell Flower and Molucca Balm, form dramatic spires of green in the garden and now it has become the flower of choice for any type of Garden. 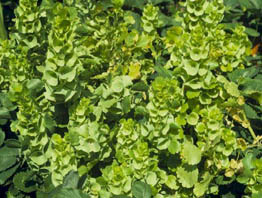 These plants can be used in containers, as bedding plants or mixed into the perennial border. 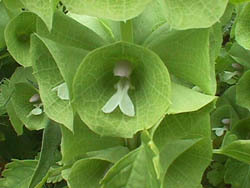 The tiny white or pinkish flowers are almost hidden within the large green bell-like calyces surrounding the flowers proper. This flower is not from really from Ireland and it comes from the Caucasus region, Syria, and Turkey. They are actually a flower that is part of the mint family and they have an aroma to them that a lot of people really can't describe. Bells of Ireland are said to give good luck to anyone that receives them so they are a great gift to give someone and a popular option for wishing that person good luck. Yes a petunia on the list! The 2014 selling season is going to be the year of the petunia. 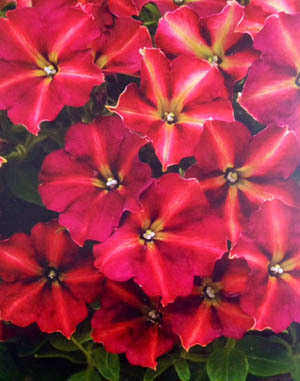 The horticultural industry is remaking the old petunia into the hottest thing on the market. Years of careful breeding and you have the most beautiful colours that have ever been produced. When the Cha-ching Cherry blooms, everybody stops to look at the colour, startling wine-colored flowers with a light yellow star. Indescribable really, but you really need to try Petunia Cha-ching with a black petunia to show off how clever you are for planting such a combination. All petunias like to grow in a sunny location and they like to be fertilized once a week with 20-20-20 and when the flowers are finished they should be removed to encourage new blooms to form.